The Red Sox announced this afternoon that they have recalled infielder Travis Shaw from Triple-A Pawtucket for Friday's game against the Toronto Blue Jays. Shaw will take the roster spot of Edward Mujica, who was designated for assignment, with David Ortiz serving his one-game suspension for making physical contact with an umpire after his appeal was denied earlier in the day. Shaw, ranked by SoxProspects.com as the 23rd best prospect in the Red Sox' system, will play first and bat ninth against the Blue Jays on Friday night. He will likely be sent back to Pawtucket on Saturday in favor of a relief pitcher - probably Matt Barnes - with Ortiz coming back from his suspension. 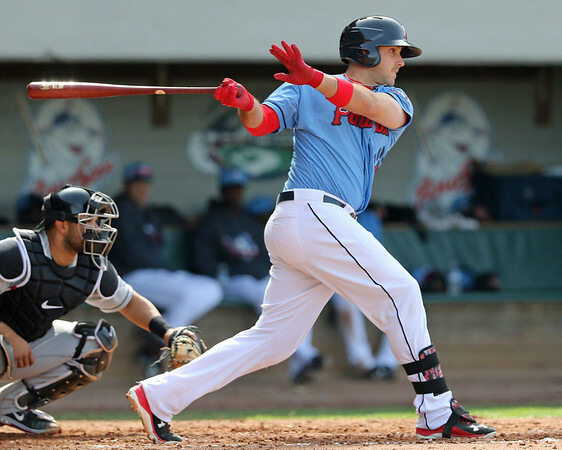 Shaw, 25, has struggled with Pawtucket this season, producing a .189/.245/.311 line in 98 plate appearances, with six extra-base hits and 15 RBIs, although his .200 BABIP despite typical batted ball data suggests that his batting average is that low in some part due to poor luck. The big first baseman hit .278/.353/.473 in 128 games between Double A and Triple A in 2014, and was added to the 40-man roster this offseason. Of note, Shaw has some familiarity with Aaron Sanchez, Toronto's Friday starter. In three games against the southpaw in 2014, split between Double-A and Triple-A, Shaw went 2 for 3 with one double, one walk and no strikeouts against Sanchez.